From the outset of the Civil War, Abraham Lincoln and his military staff knew that controlling the Mississippi River was vital to defeating the Confederacy. But to do so, the Union would need a new kind of navy, a "brown water" navy with new kinds of ships that could ply the notoriously fickle Father of Waters. That's the story Barbara Tomblin tells from the Union Navy perspective, adroitly using a wealth of letters, diaries, and memoirs written by commodores, captains, and ordinary blue jackets. These are not uncharted waters that Tomblin navigates. Since Virgil Carrington Jones chronicled operations on the western waters, others have followed, concentrating on various aspects of naval and combined army/navy campaigns. Tomblin herself has been sailing these waters since her dissertation days, and while she doesn't offer a new analysis of the military, her encyclopedic knowledge of the Union sailors and their experiences makes her narrative flow with clarity and confidence. At first, the Western Flotilla was a mongrel assortment of converted river packets and leftovers from the Mexican War. They were officered by a few, often reluctant, career naval officers, guided by some experienced pilots, and crewed by a motley amalgam of river men, new recruits, and, quite often, reluctant army volunteers. Whipping men and ships into an efficient fighting force fell to Commodore Andrew Hull Foote, an old salt described by one of his captains as "not a man of striking physical appearance, but there was a sailor-like heartiness and frankness about him." Together with another man not of striking physical appearance -- Ulysses S. Grant -- they began to change Union military fortunes and make a navy master of the Mississippi and other western rivers. By the end of the war, the Mississippi was awash with an armada of ironclads, timberclads, mortar barges, Ellet Rams, and Pook Turtles that became part of the mightiest navy in the world. The life of a sailor, whether blue water or brown, leaves a lot of free time between watches. Tomblin has found some of the most prolific and literate of them and lets their words carry much of the narrative. Captain Henry Walke, commander first of the Tyler and later of the Carondelet and Lafayette chronicles Belmont, Fort Henry, Fort Donelson, and Island Number 10 as seen from the pilot house. Irish-born seaman John G. Morison kept a journal throughout his wartime service and his gunner's description of the Carondelet's encounter with the powerful CSS Arkansas on July 14, 1862, is both accurate and descriptive. "She mounted ten heavy guns, three on each side and two forward and aft, Morison wrote. "Altogether she was a mighty unpleasant looking critter to be closing you up and at the same time throwing solid shot through you." The Battle of Memphis was strictly a navy show. Commodore Charles H. Davis's squadron, although outnumbered two-to-one, thoroughly bested the Confederate River Defense Force. Fourteen year old seaman George Yost, aboard the Cairo, reported "The battle lasted about 1 1/2 hours. The last boat was captured at 7 A.M." Mound City crewman Symmes Browne proudly told his fiancee "The Mississippi is comparatively open, and there is no more fighting for the gunboats." Browne's prediction was premature. 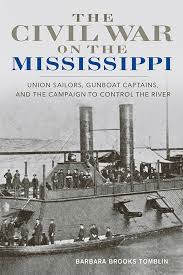 There was much more work for the gunboats and Tomblin provides detailed descriptions of the first Vicksburg Campaign, Arkansas Post and Fort Hindman, Steele's Bayou, Yazoo Pass, Port Hudson, Grand Gulf, and the final blockade and siege of Vicksburg. She concedes that "Service in the brown-water navy was not glamorous duty" but critical to to the success of Union strategic plans that would eventually win the war.